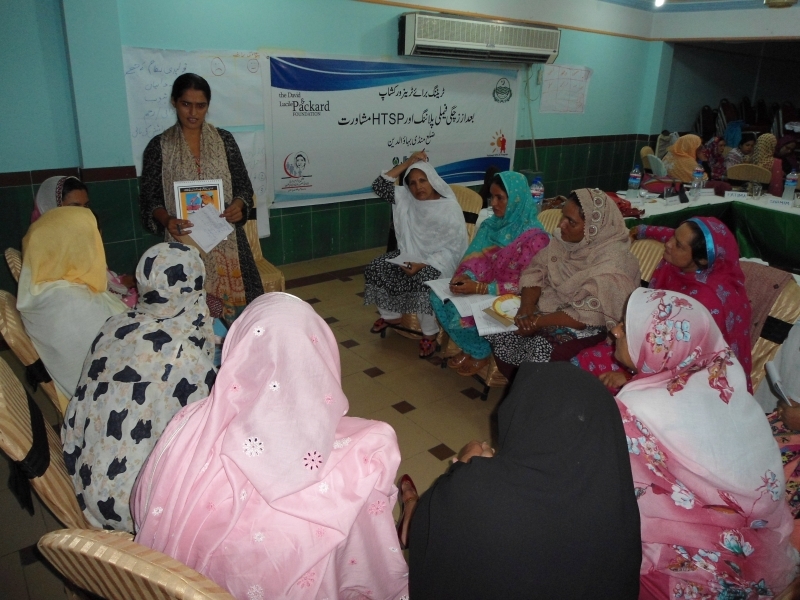 Pakistani health care providers learn about maternal health benefits of family planning thanks to Packard Foundation support. Mandi Bahauddin, Pakistan—For years, Zarina Bibi was at a loss to help the handful of women who came to her every day with unwanted pregnancies. The 50-year-old Senior Nurse Midwife at Tehsil Headquarter Hospital could do little more than sympathize with these women, some of whom resorted to life-threatening termination procedures done by untrained traditional birth attendants in the community. Now, thanks to a Jhpiego-led initiative funded by the David and Lucile Packard Foundation, Nurse Bibi is counseling women on family planning methods to prevent unwanted pregnancies and space their children for the health of mother and child. Bibi was among the 425 health care providers who learned about postpartum family planning methods, including the postpartum intrauterine contraceptive device (IUCD), and strengthened their skills in providing such services with the support of the Foundation. As part of the program, Jhpiego also collaborated with district managers from the Government of Pakistan’s health and population departments and taught them to provide supportive supervision to health facility nurses. Maternal health care providers of all skill levels participated in these courses, which took place at 21 facilities throughout the region. Immediate and post-placental IUCD insertions increased from none to 717 between May 2012 and May 2013 across two provincial- and six district-level facilities. In her work participating in the program, Bibi has been offering her clients potentially lifesaving information on how to properly space their pregnancies and adopt a long-acting, but reversible, family planning method. During prenatal care visits, Bibi now describes the benefits of family planning options to pregnant women, counsels them on a method appropriate for their family and discusses insertion of an IUCD if desired immediately after birth. Making these options available is crucial to the women served by Tehsil Hospital. Located in the Mandi Bahauddin District of Punjab Province, with a population of nearly 1.4 million people, the hospital assists in approximately 120 to 150 births each month. Most days, the hospital’s hallways are crowded with mothers holding babies in their laps and fathers who are watching toddlers. 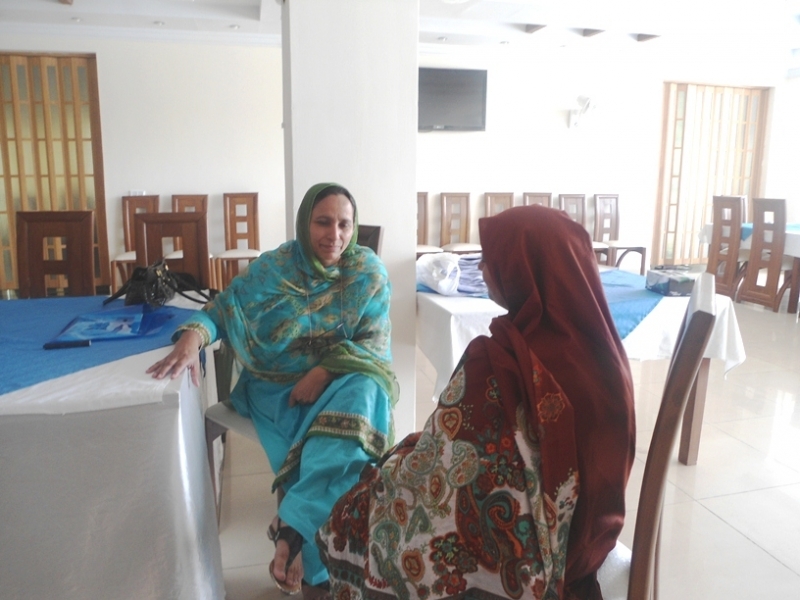 Nurse Midwife Zarina Bibi (left) learns best practices in counseling women on the importance of family planning after birth. Many women in this region have numerous children who are born within a year of one another, increasing the risk of complications for themselves and their babies. Rashida, 45, met Bibi during her thirteenth pregnancy. She gave birth at the hospital—a first—after suffering through a grueling labor and losing her previous baby during a home delivery less than a year earlier. While providing prenatal care to Rashida, Bibi discussed the dangers of repeated, closely spaced pregnancies. She explained how using a family planning method could help her stay healthy and properly care for a new baby. Immediately after Bibi delivered Rashida’s child, and received her consent, she successfully inserted an IUCD. “Offering a family planning method immediately after delivery is such good news! Sending them back home safe in a single visit is amazing,” said Bibi. In the past six months, the hospital has provided 56 new mothers with IUCDs. As part of a comprehensive approach to improve health care services for women, Tehsil Hospital has collaborated with Lady Health Workers who visit women in the community and convince them to come to the hospital for antenatal care and to deliver their babies there. This outreach is another opportunity for the hospital to offer postpartum family planning services to a larger population. By continuing to implement postpartum family planning education programs like the one Bibi attended, Jhpiego and the David and Lucile Packard Foundation hope not only to address the high numbers of women in Pakistan who continue to die from repeated pregnancies and complications of unsafe terminations, but also to empower Pakistani women to take greater control of their reproductive health.